YummyInTheCity: il laboratorio del gelato on FreshDirect! 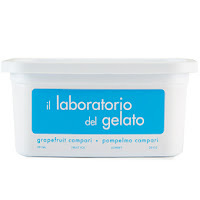 il laboratorio del gelato on FreshDirect! Now it comes every Sunday morning with my groceries - all packed up and delivered to my door. It's like Christmas every Sunday. They don't carry a ton of flavors, but I expect that will change over time and seasonally. One of my favorites is the Thai Chili Chocolate. Delish. It's not cheap, $9.99 for 20oz container, or 2 for $18 right now. One note - which is odd to me, on their website you can order a giftpack of 4 20 oz containers for $60 + $10 shipping = $70. On FreshDirect, you can get 2 for $18, or 4 for $36 - with free delivery with the delivery pass. AND you can only buy 1 if you want. Sure they don't have all the flavors, but that sounds like a good deal to me!